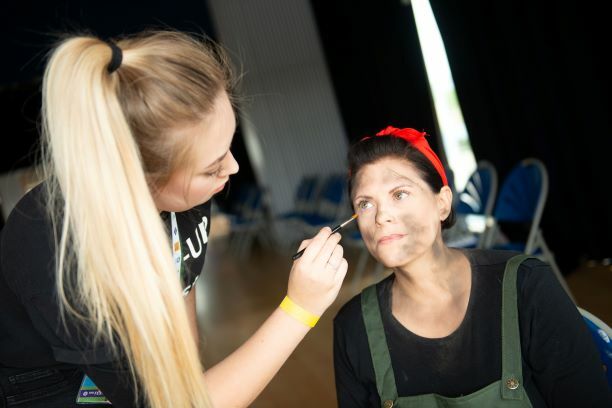 Creative make-up students from Stockton Riverside College are using messages about climate change in their end of year show after being inspired by working at last year’s Festival of Thrift. 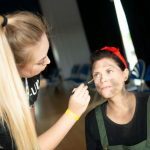 The talented team from the college’s Level 3 UAL Production and Performing Arts Make-up course, who did the make-up for the catwalk models at the Festival’s Oxglam fashion show, have called their show ‘What on Earth’. As part of their event on May 7, groups will create make-up effects to reflect the issues of plastic pollution, human over-population and looking after the planet. 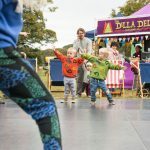 The green theme is the result of the time the students spent at the Festival of Thrift, the UK’s national celebration of sustainable living, Production Arts lecturer Nina Harper said. 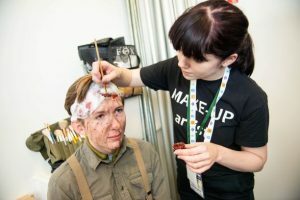 She added that the themes also reflect the challenges that professional make-up artists face and the range of creative and artistic skills they are required to use. “It’s far more complicated than it looks on Instagram. The students have to learn how to interpret a wide range of themes, understand the audience and the occasion and respond to the clothes, setting and lighting. “They also have to consider hygiene issues as well as maintaining a professional demeanour and observing on-set etiquette. 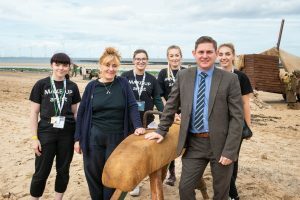 Former students from the Stockton Riverside College course have gone on to careers as artistic directors for leading make-up brands, including NARS, as well as working on TV and film sets on a wide range of productions that include Coronation Street. 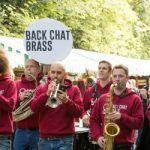 Nina added that the backstage Oxglam catwalk work at the Festival of Thrift, and being involved in transforming volunteers into war-scarred soldiers as part of the Festival’s Atonement Redux filming on Redcar beach, was invaluable for the students. 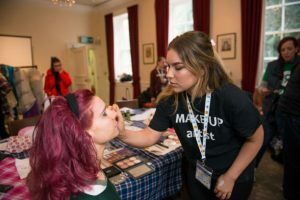 Beyond what the students learned at the Festival about ways to counter the throw-away culture, Nina notes that the make-up industry is also adopting more environmentally-friendly practices. 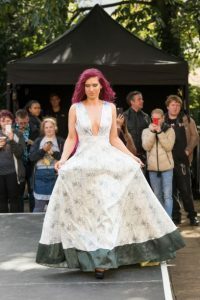 The make-up students are returning to support the Oxglam fashion show again at the seventh Festival of Thrift, which takes place on Saturday 14 and Sunday 15 September at Kirkleatham near Redcar. Festival of Thrift director Stella Hall (pictured with make-up students and Redcar and Cleveland College Campus Principal Jason Faulkner on the set of the Festival’s Thrifty Atonement film) said: “The students’ impressive skills and talent really added to the professionalism of this year’s Oxglam show and it was wonderful to be able to provide the opportunity and experience for them.